Mr Herbert H Thomas from Millom, a local schoolmaster and later a schools music organiser, was selected as effectively the first regular conductor (the initial appointee having resigned after only a fortnight). At the opening rehearsal on 9 July 1931 in the Abbey Road Club, twenty-five choristers presented themselves. The choir had immediate success, gaining first place only twelve weeks later at a revived Barrow-in-Furness Musical Festival. This win was soon repeated at the Workington Musical Festival. In addition to competitive singing at festivals (which featured very regularly until the early 1980s and rather less frequently in subsequent years) the choir assisted local and national charitable organisations by performing in concerts without payment. Disputes with the parent institute regarding membership requirements led to the choir moving out in 1936 to the Thwaite Street School. Here they operated for some years as an independent unit under the name Barrow & District Male Voice Choir. However from April 1941 their operations had to be suspended due to the Second World War. During 1945 the choir was able to resume its previous activities and also to accept an invitation to move back to the Working Men's Institute under its original name. In 1946 the choir was invited to broadcast on BBC radio in conjunction with Vickers-Armstrong Shipyard Band in the feature "Sounding Brass and Voices". Then in 1951 it appeared along with several well known national choirs and brass bands at the Royal Albert Hall London, in the inaugural presentation and broadcast of "The Rainbow", a tone poem by Christopher Hassle set to music by composer Dr Thomas Wood - by chance a boyhood resident of Settle Street in Barrow. The choir usually took part in one or two competitive festivals every year with many successes, winning the prestigious Blackpool Festival in 1969, under the baton of Gilbert Uren. In the late 1970s the choir was invited to take part in a BBC television programme called A Grand Sing and in January 1980 they emerged from many entrants as winners of the male voice class. Micheal Graham, Sid Williams, Jack Garner, Ken Ralph, Peter Bubber, George Dickson, Norman Dandy, Unknown, Ernie Johnston. Edwin Griffith, Fred Morgan, Les Sonofeld, Les Stewart, Bob Gerrard, Mr Oxley, Harold Sharpe, Ted Wilson, Alan Bolton, Sam Strange, Alan Barber, Unknown, Ben High, Unknown. Bill Ritto, Henry Webb, John Babbs, Harold Kerr, Reg Lanworn, Martin Tonge, Unknown, Unknown, Aurthur Silver, Barry Schofield. The choir generally performed around fifteen concerts a year, and in 2000 it took part in two mass male voice concerts for the new millennium. One was held at Whitehaven with three hundred voices and another at Manchester with around two thousand voices. The year 2001 saw our 70th birthday and we made it a special year by staging a bumper concert at Barrow's theatre venue Forum 28 and by holding extra social events. During the next few years the choir was also represented amongst those attending the Festival of Sound and Brass, held in London's Royal Albert Hall (2006 & 2009). In 2008 the choir visited Derbyshire and performed in Tideswell Parish Church alongside Thorntons Brass Band. In October 2010 there was another memorable concert in Forum 28 in conjunction with the touring Wagga City Rugby Male Choir from Australia. The visiting singers included the former Barrow and Great Britain Rugby League star Phil Jackson, making a nostalgic return to the town. The year 2011 was another anniversary, the choir's 80th and this was celebrated with a concert at the Forum. In 2012 the choir visited South Wales and performed at the Millenium Centre in Cardiff and shared a concert with Cowbridge Male VoiceChoir at All Hallows Church. Travelling further afield in 2014 the choir visited Ireland and sang in Christ Church Cathederal, Dublin and in St Mary's,Tipperary. Much Wenlock Male Voice Choir were hosted here in Cumbria in 2015 and a joint concert was held in the Victoria Hall, Grange over Sands. In 2016 the choir performed a joint concert with Beverly Male Voice Choir in The Methodist Church, Ulverston. Later the same year the choir travelled to Belgium and The Netherlands and performed on the Hull to Rotterdam Ferry, at Mechelen Cathederal and at the Arnhem Airborne Museum. 2017 highlights included a memorial concert for local born musician Thomas Round with Barrow Savoyards, and a joint concert with Much Wenlock Male Voice Choir in Shropshire. In recent years the Choir has shared performance nights with local musicians including Saxophonist, Jess Gillam at annual concerts in 2011 and 2013 and Tenor, Ian Honeyman in 2012. The original conductor H H Thomas [photo centre front] retired in 1951 due to ill-health. He was succeeded by Gilbert Uren, who like his predecessor worked in civilian life as a teacher and the local schools music advisor. 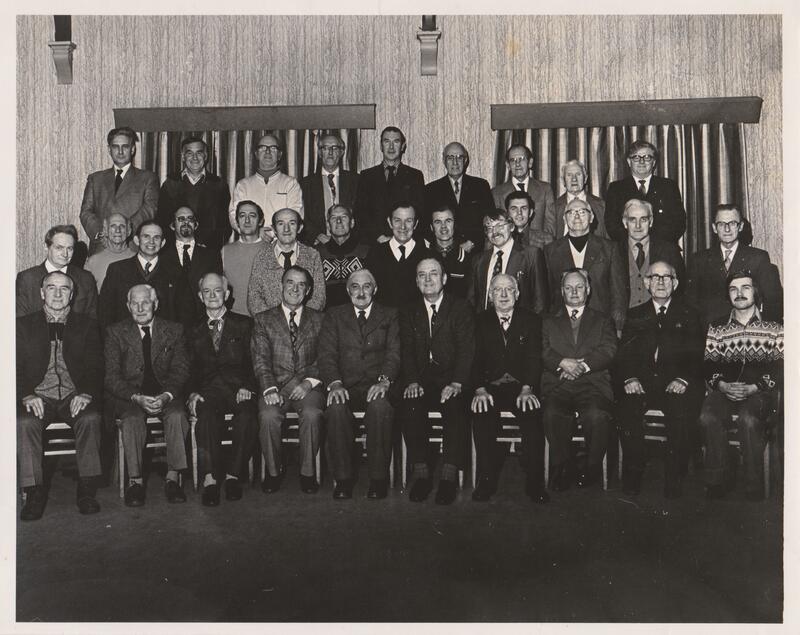 Subsequent conductors following Mr Uren's retirement in 1975 can be traced via the covers of various programmes for the choir's annual concerts: E (Ted) Wilson 1976-1977, a bass singer and a former conductor of the Vickers Male Voice Choir; Reginald Lanworn 1978-1982 [photo centre front] ; William Crawford 1983-1984; Michael Petty 1985-2003, Les Stewart in 2004, and Anthony Milledge from 2005 until 2017. Local solicitor Martyn Tongue gave the choir more than forty years of voluntary service as a piano accompanist up to the 1996 annual concert, when he was succeeded by Rita Matthews and Sue Quarmby who shared the duties, Rita was succeeded by Christine Searle who remained with the choir until 2005 when she was succeeded by Margaret Harrison. For many years the choir would hold two rehearsals each week on Mondays and Thursdays, but this was eventually reduced to one per week. A new code of rules had been approved in 1935, whereby members failing to attend three successive rehearsals (without sufficient reason) were liable to be excluded from the choir. Rehearsals were held mostly in an upstairs room at the Working Men's Club's main premises in Abbey Road. The same building also housed the choir's music library - an arrangement which lasted until 1996. Subsequently the venue had to be transferred to the nearby Salvation Army citadel, although this agreement ended a year or two later. The choir then moved permanently to the Holy Family Catholic Church Hall in Newbarns, which had already been used briefly during the transitional arrangements after vacating the Working Men's Club. In 2018 they moved once again - to the Nan Tait Centre, Abbey Road, Barrow. Annual concerts have been held fairly regularly since 1952. The same year also saw the first of a series of annual dinners, although these were eventually discontinued. Before the 1980s there had been no official uniform - members appearing at concerts would generally wear a dark suit or evening dress together with a bow tie. Eventually light blue shirts were adopted for the choir's television appearance in 1980, and these were supplemented shortly before the 1983 annual concert with navy blue blazers. New maroon blazers and ties were purchased in 1992, with financial support being raised from raffles and various sponsors. Maroon then remained the favoured colour until October 2011, when the choir reverted to a new set of dark blue blazers and ties, on the occasion of their annual concert. Portable staging was initially built by first tenor Denis Reed, this later being commemorated by the addition of a small plaque which recorded his choir membership between 1993-2003. New staging was subsequently purchased in July 2013, aided by a substantial grant from the Sir John Fisher Foundation. In 1996 revenue problems had forced the closure of the Barrow Working Men's Club and Institute, thus depriving the choir of its main sponsor. As a consequence it was decided to adopt the simpler name Barrow Male Voice Choir. This also reflected the fact that it had become the sole survivor of several similar male voice choirs which had in previous times operated in south-west Cumbria. These had included separate choirs in Ulverston, Millom, and in several local workplaces, including the Vickers shipyard at Barrow. Today the choir's membership fluctuates around the thirty to forty mark (although the aim remains to grow still further). It still regularly enters for competition in the South Cumbria Music Festival at Ulverston.